The Crushers Post 58, an American Legion baseball team in Stayton, have moved to Keizer. Led by former Stayton High School coach Drew Heard, the team is a collection of the best players from McNary, McKay, Silverton, Regis, Kennedy and Stayton. Heard also wanted to pick the right kind of players. Eight of the 18 Crushers played for the McNary varsity team last season—2017 graduates Josiah Gilbert, Jonah Geist, Joshua Benson, Riley Hays, Brendan Frizelle and Daniel Johnson as well as rising senior Carl Rumbaugh and junior Tyler Covalt. The Crushers, who have more than 30 games scheduled between June 12 and July 19, play their home contests on McNary’s Vic Backlund Field. Keizer plays in the six-team Area 3 with squads from Salem, Dallas, Albany, Corvallis and Newport. After the regular season, the top four teams will play another area in a best of three super regional with the winners advancing to the double elimination state tournament in Klamath Falls at the end of July. The Crushers opened the season 4-3 after falling at Corvallis 7-0 on Monday, June 19. 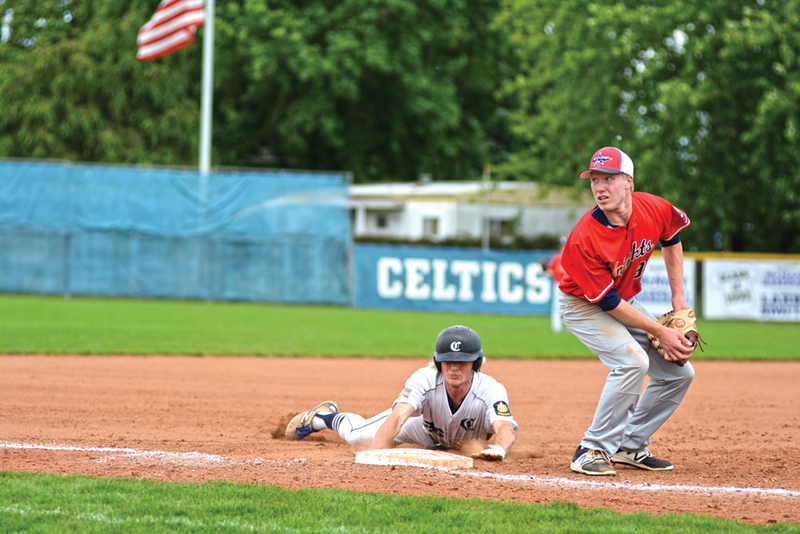 Keizer split with the Gerding Builders on Sunday. After losing the first game 6-3, the Crushers won the second game 2-1 in 12 innings. Geist scored the winning run on an error. Gilbert got the start on the mound and allowed just six hits and one unearned run over eight innings. He struck out 11 and walked two. “The difference in Josiah from a year ago is almost indescribable,” Heard said. Hays earned the win, allowing just two hits over four shutout innings. Keizer swept N.W. Stars Academy 8-3 and 8-5 on Saturday. Geist was 1-for-3 with a triple and two RBIs while Covalt was 2-for-3 and scored a run in the first game. Brycen Schumacher was 1-for-2 with a double and two runs in the second game. The Crushers are taking a break from league play to host a tournament June 22-25 that includes a team from Perth, Australia. Pool play games are scheduled for 5 p.m. on Friday and Saturday. The championship game will be played on Sunday at Willamette University. “We had a lot of meetings before the season that we wanted to change the mentality of the program and to change the way the program has done things in years past,” Heard said. After almost a year of talking about installing a bike air pump/repair station around the Keizer Civic Center, the new amenity is on the way. Hersch Sangster, chair of the Keizer Traffic Safety, Bikeways and Pedestrian Committee, updated the committee on rapid progress in a meeting Thursday, June 8. Sangster said he’d been passing out fliers hoping to drum up financial support for the project whenever he could and crossed paths with Steve Dickey, operations officer for Salem-Keizer Transit. That led to contacting Kiki Dohmman, head of the Cherriots Trip Choice program, which had extra funds to spend before the end of the fiscal year on June 30. “The station has been ordered and we will be reimbursed for the cost,” Sangster said. 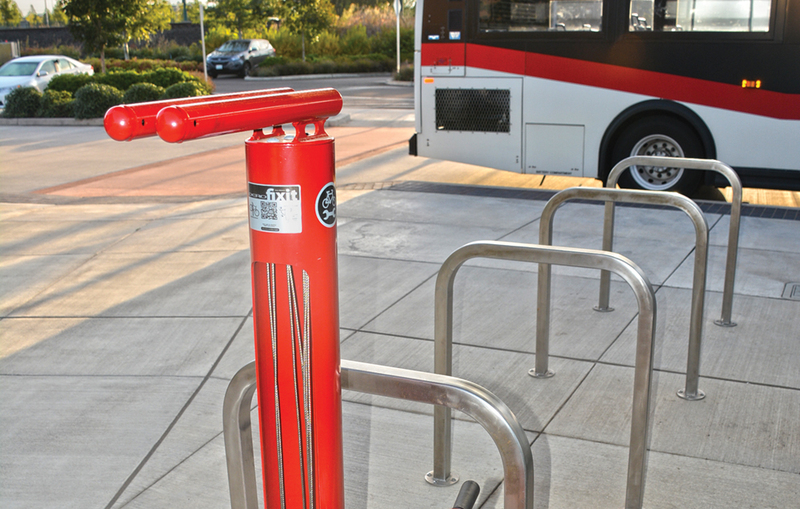 Keizer public works staff will install the station near the bike rack at the Keizer Civic Center. Sangster hopes it will be up and operational by August. • Committee members Pat Fisher and Kathy Lincoln took a field trip to Cummings Elementary School to observe traffic problems around the school in hope of finding some way to alleviate potential hazards. “The problem is that there is more than one problem,” Fisher said. The 450-student school has only one bus route and the rest of the student body walks, bikes or gets dropped off by parents and guardians. Some of the issues identified included: drivers making U-turns on Delight because of poor connectivity in the streets around the school; parents and guardians parking along most of the neighborhood streets adding to congestion and pedestrian traffic; and volunteer traffic coordinators are not always in sync. “Solving a problem in one area could push it into another area,” Fisher said. The pair came to the conclusion that the best path forward would be following the Safe Routes to Schools action plan, which would involve assembling a committee of parents, faculty and city staff to come up with a holistic solution. “You would at least have a chance to hear about all the issues and get a consensus about things that could be done and the inconveniences associated with some of the options,” Fisher said. • Fisher also had an update on the potential for new wayfinding signs along the Salem-Keizer Parkway bike path. Fisher spoke with Dorothy Upton, an engineer with the Oregon Department of Transportation, and determined that sign content as well as locations would need to be approved by ODOT officials. The next step in the process is sitting down with city staff to determine specifics and then running those by ODOT. After that, there will be a push to find funding. The projects is estimated to cost about $650.